TogetherWeServed - CPL Jiles P. Richardson, Jr. This Military Service Page was created/owned by Diane Short (TWS Chief Admin) to remember Richardson, Jiles P., Jr. (The Big Bopper), CPL. It was a tragic day 54 years ago today in music history indeed. It was the day that music lost some of its shining, most earliest influential figures, men who opened the floodgates and created some of the blueprints that formed, shaped, and created rock and roll: Ritchie Valens, The “Big Bopper”, and the bespectacled skinny kid, who created rock and roll arrangements which still get used, drawn and quartered, becoming etching and drafting tools in a way for the entire schematic of that genre, Buddy Holly. It was on February 3rd, 1959, near Clear Lake, Iowa, that the single engine 1947 Beechcraft airplane carrying the aforementioned musicians crashed during a past-midnight run in which there was rather inclement, icy conditions. The men had earlier been part of a Winter Party Dance Tour, which was making its way across the country. After finishing the gig, Holly had been frustrated with the conditions of a tour bus that he and his cohorts had been using, one which was not equipped for the cold winter weather which gripped the Midwest and Great Plains that year. He finally decided to rent an airplane to jettison himself and whoever wanted to accompany him, to the following gigs. Those people turned out to be Ritchie Valens (who was a singer who had hits like “Come on Let’s Go,” “Donna,” and the great early rocking pot boiler “La Bamba”), J.P. “The Big Bopper” Richardson (who was a DJ, but also had had a hit with the song “Chantilly Lace”), and 21-year-old Roger Peterson, who was the pilot of the aircraft. Holly’s backup band, consisting of future country superstar-legend Waylon Jennings, opted for taking the tour bus, as the small plane could only seat four. In what turned out to be a cryptic bizarre dark turn of events, although at the time it was just considered harmless ribbing, The Big Bopper had asked Jennings (who originally was going to get on the plane) to let him go on the plane instead because he had flu-like symptoms and didn’t want to ride the icy coach which sported no heat. When Holly found out about the switch, he said to Jennings in jest, “Well I hope your ol’ bus freezes up,” to which Jennings responded, “Well I hope your ol’ plane crashes.” It became words that would haunt Jennings until his dying day back in 2002. The cause of the crash, which was determined and ascertained by the Civil Aeronautics Board (which later became the National Transportation Safety Board) noted that it appeared that the pilot (Peterson) became visibly disoriented by the attitude indicator on the instrument panel, and lost control of the plane when the right wing’s tip of the aircraft hit the ground, causing the plane to spiral and finally land into a bean field nearby across the frozen landscape, killing all the men aboard. It was further found out via the thorough investigation that the pilot hadn’t had much experience flying in the wintery, weather conditions, which also was a direct cause of the crash. The aftermath of the crash was an ominously sad time, in which the rock community and the many fans of the respective men and their talents were stunned and crushed, a heavy weight for all to endure indeed. It was also the first of these kind of, as the urban terms would later coin it, “rock and roll deaths,” and an unfortunate pattern which other artists who later died in similar circumstances, like Otis Redding, Jim Croce, members of Lynyrd Skynyrd, Stevie Ray Vaughn, Ozzy guitarist Randy Rhoads, and music promoter kingpin Bill Graham among others, would follow by way of their own tragic circumstances. 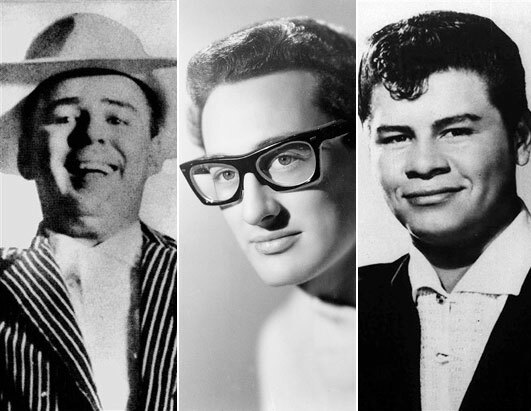 The legacy of the three musicians was instantly propelled and thrust into legend upon their deaths, and their influence, especially Buddy Holly’s, who was already a pioneer of the early days of rock and roll with his songs like “Peggy Sue,” “That’ll Be the Day,” “Oh Boy,” and many others, became staples to the generations who followed him when he was alive, and especially to the generations he influenced in the wake of his death, and which continues on in today’s musical climate. He became a figure both mythologized and lionized for his contributions to the musical community and how far his range, vision, and scope had reached. There’s no telling what other summits he may have achieved had he lived. Of course, the dark day of the tragic events that occurred on February 3, 1959, have been immortalized bearing the title “The Day the Music Died.” That banner headline comes from a song which spoke of the tragedy, the number one hit by folk singer/songwriter Don McLean, entitled “American Pie” (originally released in 1972) in which he used the tragedy as not only a metaphor for a chapter closing on American music that fateful day, but also as an allegory on a chapter turning in American history, a kind of innocence lost that the country and the world would experience again four years later, on November 22nd 1963, when President John F. Kennedy would be taken down by an assassin’s bullets in Dallas, Texas. The latter event also effectively turned another page on a sort of normalcy that the country experienced, and quickly thrusting it into a place in the coming years, where the unknown and intimidating factors of having to embrace that unknown, ultimately created positive and negative changes the likes of which were never seen again as the 1960s wore on. So, although today is a sad remembrance of being the day the music died, it can also be used as a catalyst to resurrect the music, and being a day that the music gets re-born. Find and explore the magic and genius of Buddy Holly, marvel at the embryonic sounds that came out of him, which were ahead of its time. Aurally witness the soft, intense vocal strains from Ritchie Valens, one of the first Latin singing stars of all time, whose “La Bamba” in particular became an American classic and remains one to this day, always resurfacing in some form of media or another, and don an old weathered pair of “bobby sox” (ask your grandparents if they still have a pair) and get down to the good time strains of “Chantilly Lace” by The Big Bopper. But most of all, remember the timeless quality music has, that what gets recorded, and once it is recorded, never loses its intrinsic luster or its sheen or its sonic values. It always remains what it is and always will, even if the artists who created it have long since eroded, passed on, withered, dried up, or turned to metaphoric sands, by the passages of time.